Talmudical commentator and historian, died shortly before 1588. He came of a family of scholars, both father and grandfather being known as Talmudists. Joseph Solomon Delmedigo bestowed upon Algazi the title of "Gaon," at the same time declaring that he was the most prominent pupil of Delmedigo's ancestor Judah ben Elijah. Algazi does not seem to have left Crete; but the fact that this island belonged to Venice made it easier for Algazi's name to become known in Italy. Men of prominence ranked him among the great teachers of his time. 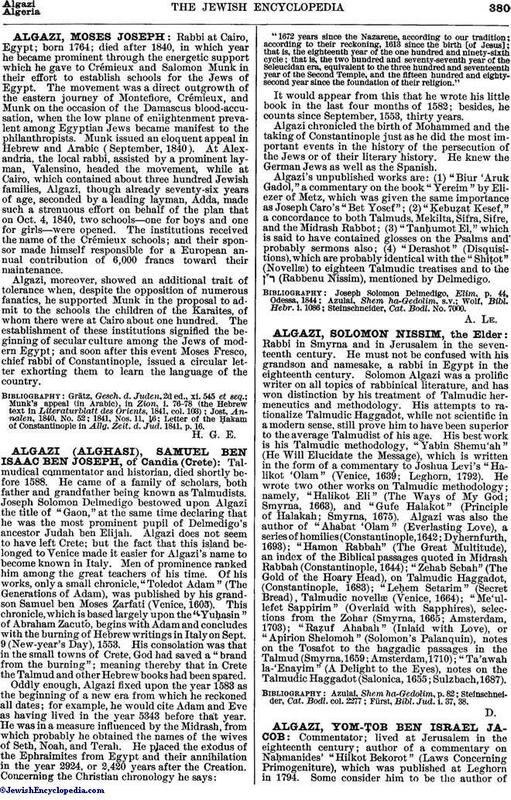 Of his works, only a small chronicle, "Toledot Adam" (The Generations of Adam), was published by his grandson Samuel ben Moses Ẓarfati (Venice, 1605). This chronicle, which is based largely upon the "Yuḥasin" of Abraham Zacuto, begins with Adam and concludes with the burning of Hebrew writings in Italy on Sept. 9 (New-year's Day), 1553. His consolation was that in the small towns of Crete, God had saved a "brand from the burning"; meaning thereby that in Crete the Talmud and other Hebrew books had been spared. "1672 years since the Nazarene, according to our tradition; according to their reckoning, 1613 since the birth [of Jesus]; that is, the eighteenth year of the one hundred and ninety-sixth cycle; that is, the two hundred and seventy-seventh year of the Seleucidan era, equivalent to the three hundred and seventeenth year of the Second Temple, and the fifteen hundred and eighty-second year since the foundation of their religion." It would appear from this that he wrote his little book in the last four months of 1582; besides, he counts since September, 1553, thirty years. Algazi chronicled the birth of Mohammed and the taking of Constantinople just as he did the most important events in the history of the persecution of the Jews or of their literary history. He knew the German Jews as well as the Spanish. Algazi's unpublished works are: (1) "Biur 'Aruk Gadol," a commentary on the book "Yereim" by Eliezer of Metz, which was given the same importance as Joseph Caro's "Bet Yosef"; (2) "ḳebuẓat Kesef," a concordance to both Talmuds, Mekilta, Sifra, Sifre, and the Midrash Rabbot; (3) "Tanḥumot El," which is said to have contained glosses on the Psalms and probably sermons also; (4) "Derashot" (Disquisitions), which are probably identical with the "Shiṭot" (Novellæ) to eighteen Talmudic treatises and to the (Rabbenu Nissim), mentioned by Delmedigo. Steinschneider, Cat. Bodl. No. 7000.